Tour the castles, abbeys and villages of Chianti with Tuscan Wine Tours. Florence and Siena struggled for supremacy over one another and their respective Tuscan territories, villages, castles and dependencies for several centuries. 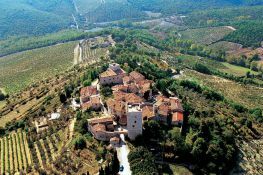 A large part of this conflict involved the territory that lies between them - now famous as the Chianti Classico wine zone. 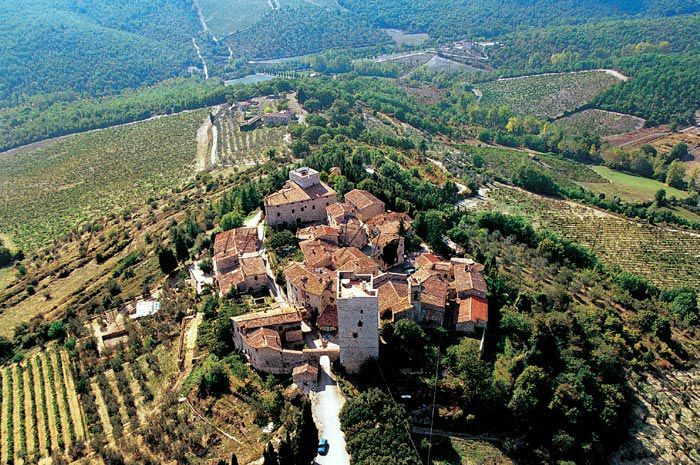 Not surprisingly, Chianti is therefore dotted with fortifications of one kind and another. Some of these are castles and their outlying watch towers, some are fortified Renaissance villas and others are fortified abbeys and even whole villages and towns. 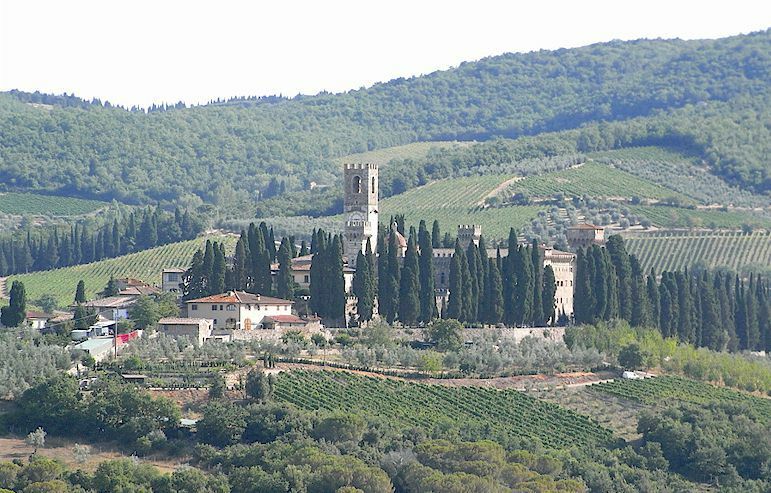 Visits to these interesting and often beautiful sights are important elements of our shared and private Chianti Castles and Wines tours. The town of Panzano in Chianti is centred on the remains a Tuscan castle which is partly incorporated into the church of Santa Maria Assunta, with one of the remaining towers of the keep now being a private residence. 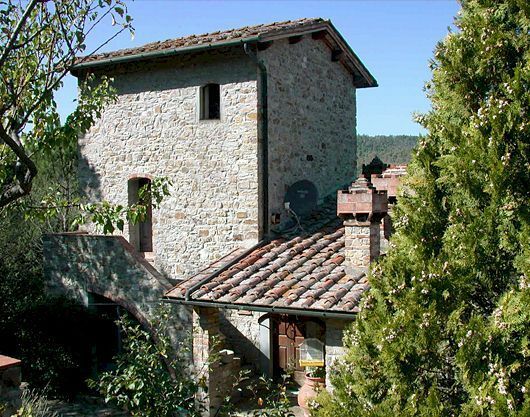 Several of the outlying watch towers have been incorporated into farmhouses such as Casa Mezzuola and Casa Ramoli. 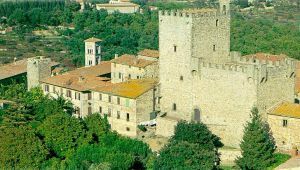 In Castellina in Chianti, the massive "rocca", the keep of the castle, remains largely intact in the centre of the town. Other "castelli" were not built first and foremost as military structures but are Renaissance villas that have either replaced purely military architecture and/or have been fortified. 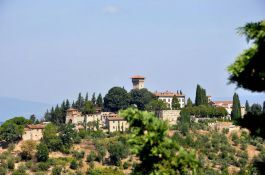 Among the best known are Castello Vicchiomaggio and the Castello di Verrazzano, both known as producers of excellent Chianti Classico wines, and the Castello di Uzzano, a massively fortified villa that is now a private residence. 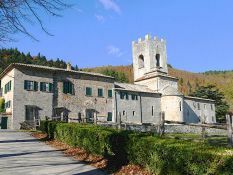 Churches, monasteries and abbeys are distributed throughout Chianti. The very oldest of these religious buildings are parish churches (pievi) and these are often not fortified. 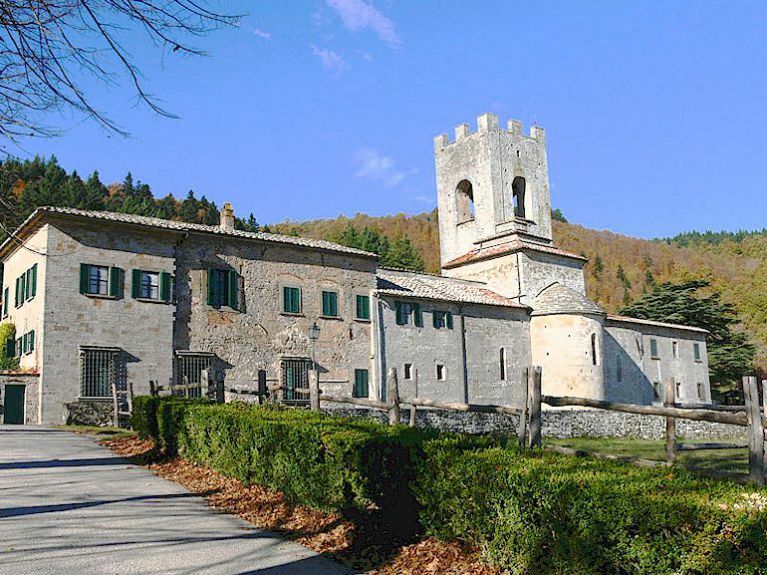 One of the earliest is the Pieve di San Cresci, first documented in 963 and still a church though encrusted over the centuries with additions that are now farm buildings. In fact Podere San Cresci produces excellent Chianti wines. The larger establishments had to be fortified against the depredations of contending armies. 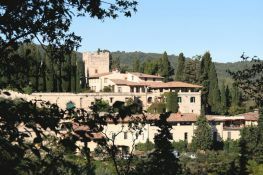 Two famous examples are the Badia a Passignano and the Badia a Coltibuono, the latter now in private hands and famous for its Chianti Classico wines. 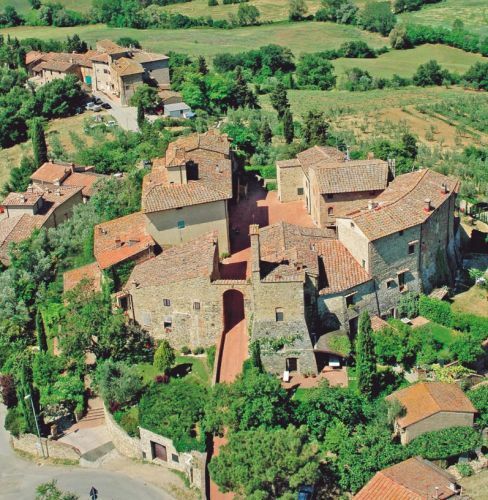 Fortified villages are highly characteristic of Chianti as well as elsewhere in Tuscany. These inhabited nuclei evolved as houses were incorporated into the outer ring walls around castle keep. 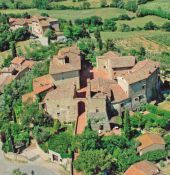 One of the most attractive examples is Montefioralle where the keep on the summit of the hill has been replaced by a church and the space between the double circuit of walls has been filled with houses. A circular lane runs between the houses and the foot of the keep. Other examples are Vertine and Tignano. Finally, most towns and cities were surrounded by walls. In Florence the city walls were in large part dismantled in the 19 C, the material being used to fill in the moat to create the existing ring road. Many smaller Chianti towns have extensive remaining walls, among them San Donato in Poggio and Castellina. The village of Monteriggioni is surrounded by one of the best examples of an intact curtain wall in Tuscany.